Doesn’t it feel like some books are too sacred to write upon? I go back and forth, and have various procedures. I’m embarrassed to say that for my favorite books (some of the ones I use for class) I have two copies on the shelf–one desk copy in which I’ve written, and one pristine. I always want the visually uncluttered reading experience, when possible…or at least I fantasize that somehow I can go back to the time of that first reading, and experience it again. Now it strikes me that it’s like a specific cone of melon gelato I had in Italy last month. 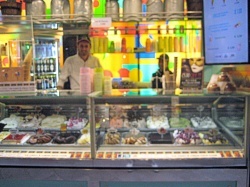 The melon gelato was so good, I immediately wanted to experience that cone again. I sit at my desk in Ohio and regret not going back for another, but it would not have been the same. This entry was posted in Uncategorized and tagged books, gelato, reading like a writer. Bookmark the permalink. You were in Italy? Lucky girl. I do the same thing with books – and often buy cheapish to-write-on copies through Amazon or at book sales. Umm…it might not be the same, it might be even BETTER than you remembered! So true, Vanessa! Go back and check for me, okay???? ?